Welcome to March. With another month under our belt and another milestone reached, CycloneCenter had a really good month. This month we had nearly 10,000 classifications and surpassed 400,000 for the project so far! This month also saw Atms345_KJD replace mcrisalli1 on the Bretarn Board (which tracks total contributions from each scientist). Atms345_KJD now has 2561 classifications and is 13th all time. For January 2015, we had 9985 classifications of 682 storms from 402 citizen scientists (with 57 returning scientists and 345 new this month). This month’s storm image is from a talk post from cch001. 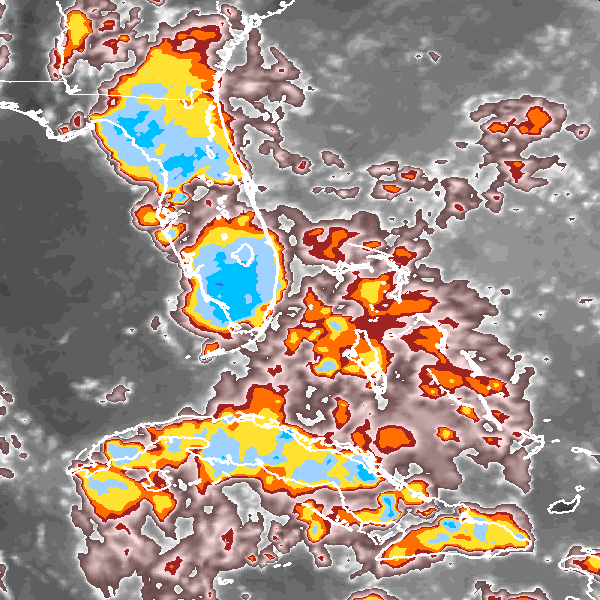 It shows an interesting situation over the Southeast U.S. and Caribbean where most of the land areas are covered with deep convection (which are really tall clouds). I spent the summer of 1992 (a year after this photo) in Miami doing some programming for the University of Miami. As a young guy from Maine, I was introduced to the most lightning I had ever experienced. The sea breeze storms rolled in the same time each day with massive lightning and heavy rain. Sea breeze storms are caused by air over land heating up faster than the surrounding ocean. This causes the land areas to have lots of rain and clouds while the surrounding seas are clear and calm. You can learn more about sea breezes at this NOAA site.